Superficial dissection of the back of the neck. Hormones from the anterior lobe of the pituitary gland (A) control the activity of other endocrine glands. Hormones from the anterior lobe of the pituitary gland include (B) thyroid stimulating hormone (TSH) (1); growth hormone (GH) (2); prolactin, which influences lactation (3); luteinizing hormone (LH) and follicle stimulating hormone (FSH), which stimulate secretion by the ovaries (4) and testes (5); adrenocorticotrophic hormone (ACTH) controlling the adrenal cortex (6). 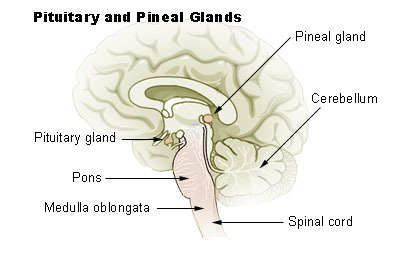 The pituitary gland is a small endocrine gland, also called the hypophysis, that is attached to the brain. The pituitary is only about 1 centimeter in diameter, or roughly the size of a pea, and is reddish-gray in color. It is nearly surrounded by bone as it rests in the sella turcica, a depression in the sphenoid bone. 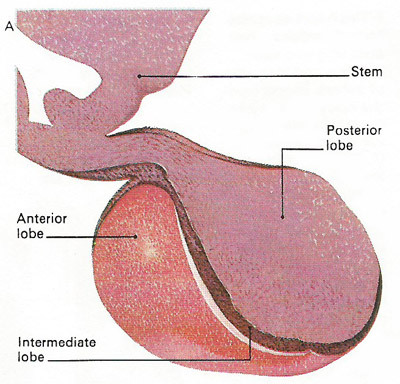 The gland is connected to the hypothalamus of the brain by a slender stalk called the infundibulum. There are two distinct regions in the pituitary gland: the anterior lobe (adenohypophysis) and the posterior lobe (neurohypophysis). The activity of the adenohypophysis is controlled by releasing hormones from the hypothalamus. 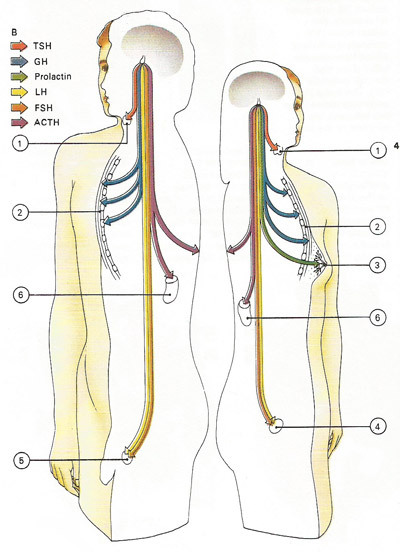 The neurohypophysis is controlled by nerve stimulation. Growth hormone (GH) is a protein that stimulates the growth of bones, muscles, and other organs by promoting protein synthesis. This hormone drastically affects the appearance of an individual because it influences height. If there is too little growth hormone in a child, that person may become a pituitary dwarf of normal proportions but small stature. An excess of the hormone in a child results in an exaggerated bone growth, and the individual becomes exceptionally tall or a giant. Adrenocorticotropic hormone (ACTH) reacts with receptor sites in the cortex of the adrenal gland to stimulate the secretion of cortical hormones, particularly cortisol. Antidiuretic hormone (ADH) promotes the reabsorption of water by the kidney tubules, with the result that less water is lost as urine. This mechanism conserves water for the body. Insufficient amounts of antidiuretic hormone cause excessive water loss in the urine. Oxytocin causes contraction of the smooth muscle in the wall of the uterus. It also stimulates the ejection of milk from the lactating breast (see mammary gland. Hypophysectomy is the surgical removal or destruction of the pituitary gland. The operation may be conducted by opening the skull or by the insertion of special needles that produce a very low temperature (cryosurgery). Radiotherapy (e.g., by insertion of needles of yttrium-90) can also be used to destroy parts of the pituitary. The pituitary was certainly known to Galen in 200 AD but its role was misunderstood. Even in the sixteenth century Vesalius proclaimed that its function was to secrete a substance into the nose. It was not until the latter part of the nineteenth century that its true properties began to be elucidated. A significant breakthrough came in 1886, when the French neurologist Pierre Marie described acromegaly and gigantism, conditions caused by overactivity and enlargement of the pituitary.